ADHD, or attention deficit hyperactivity disorder, is a term used to describe various combinations of symptoms related to impulsive behavior, inattention and hyperactive behavior. These symptoms typically manifest in childhood and may continue into adulthood. Studies show that supplemental doses of the hormone melatonin can reduce sleep-related problems in children with ADHD. However, melatonin does not improve ADHD's primary symptoms. 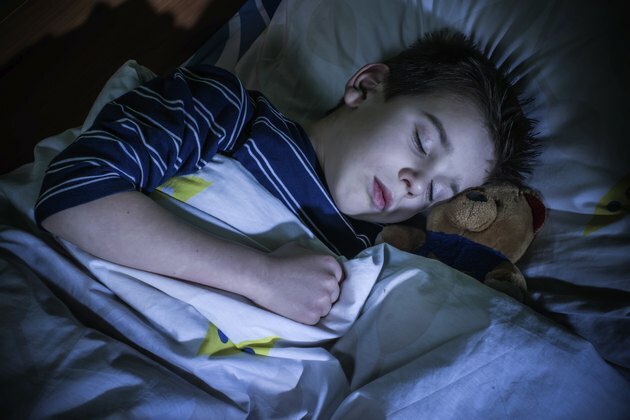 According to a 2009 review published in the American Academy of Pediatrics' "Pediatrics in Review," roughly 29 percent of children with ADHD who receive ongoing treatment with stimulant medication have significant sleep disturbances. Children who take the ADHD medication methylphenidate have a particularly high rate of sleep problems, and fully 54 to 64 percent of these children experience symptoms of insomnia. Roughly 19 percent of children with ADHD who don't receive stimulant medications also have sleep disturbances. In comparison, approximately 6 percent of children without ADHD have sleep problems. Your brain's pineal gland naturally supplies your body with melatonin. You need this hormone to help regulate your internal circadian rhythm, which helps control day/night cycles and your normal sleeping patterns. Most melatonin supplements are produced artificially in a laboratory setting. Commonly available supplemental forms of the hormone include creams, capsules, tablets and lozenges that you can place under your tongue for easier absorption. In addition to its use in sleep-related problems, melatonin is sometimes used to combat the effects of conditions that include cluster headaches, jet lag, smoking withdrawal and a movement-related disorder called tardive dyskinesia. Several different types of studies support the use of melatonin to treat sleep disturbances in children with ADHD, "Pediatrics in Review" states. In particular, these studies show that melatonin can reduce sleep onset latency, or SOL, which describes the amount of time required for a person to go from full wakefulness to sleep. Despite the sleep improvements associated with melatonin supplementation, children with ADHD who take this hormone don't typically experience improvements in the overall manifestation of their symptoms, according to the U.S. National Library of Medicine's MedlinePlus. Children with ADHD can usually take fairly high doses of melatonin for as long as four weeks without specific safety risks, "Pediatrics in Review" reports. However, doctors don't fully understand the effects of melatonin use over longer periods of time. Dosages used in ADHD sleep studies ranged as high as 3 to 5 mg per day. This level of supplementation can trigger seizure activity in children, according to the University of Maryland Medical Center, and seizures have occurred in study participants. However, these seizures typically stopped when melatonin use ended. Because of the potential for seizures and other problems, you must strictly avoid giving melatonin to your child without a doctor's explicit consent. Is Melatonin Safe for Toddlers? Can I Take Ambien & Melatonin Together At Night?